I like white kitchens and I cannot lie. Although I did give a good deal of thought to all the kitchen details, I really never much waivered on the idea of white cabinets. 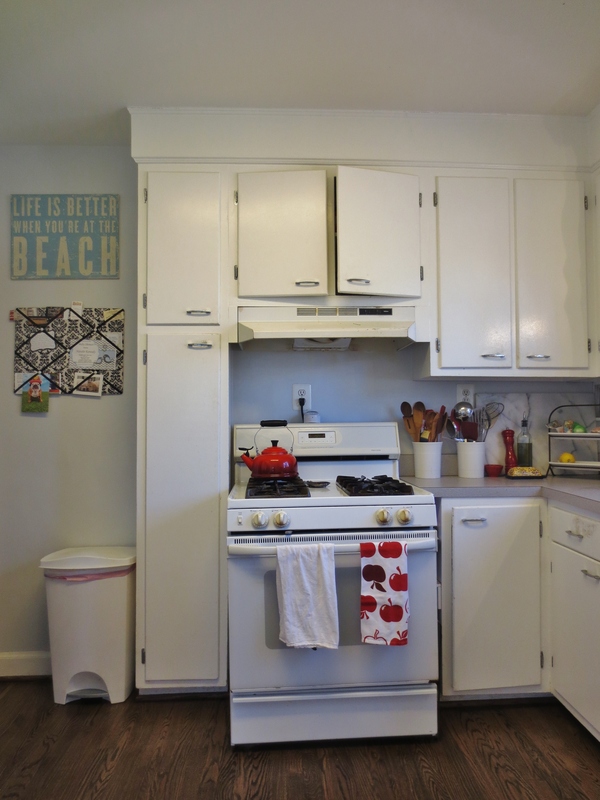 I prefer painted cabinets to any of the natural wood looks, so I didn’t consider any of those. There are some beautiful grey, grieges, and tuxedo kitchens out there, but I didn’t think the space was large enough to do different color uppers and lowers and I liked white enough that I didn’t think spending the extra coin for a custom color was necessary. In keeping with the period of the house and their overall popularity, I chose a traditional shaker door profile for the cabinets. The cabinet company we choose was Merillat. Our kitchen designer recommended it based on our style preferences and budget. They have three different product lines and we ended up going with their Masterpiece line as this line had the pieces that best fit our space such as the 16″ deep cabinet for the sun room wall and the 18″ tall pantry for next to the refrigerator. The door style we chose is Martel in maple with a Dove White paint and no glaze. The image above shows both a shaker profile for both cabinet and the drawer door. We actually chose chose to do a “slab,” i.e. non-shaker profile, for the drawers. My kitchen designer told me that going with the slab profile would give the space a more traditional look, and I liked that it felt cleaner and not as busy. For the hardware, I chose chrome cup pulls for the drawers and a fairly simple knob for the cabinets. The cup pulls are Schaub & Company Traditional Collection 3″ Cup Pull in Polished Chrome and the knobs are Schaub & Company Select 1 1/4″ Knob in Polished Chrome. I ordered them online from Knobs4Less.com. Both the cabinets and the hardware were fairly easy choices for me. Where I started over-thinking was the countertop. Basing my choice purely on looks alone, I would choose marble. But budget and maintenance made this option not as attractive. Granite tends to be too “busy” for my taste and the only real granite option I liked was honed solid black. However, I decided that I didn’t want a dark counter surface so I searched for other, lighter options. I looked at several quartz options such as Silestone and Cambria as well as Corian, another man-made product. Then my mom told me about another stone option, Quartzite. Quartzite is not the same as quartz. Quartzite is a natural stone like granite or marble. It is an extremely hard rock that is not water or acid-soluble. On the Mohs test that measures how hard a material is, it has been given a hardness reading of 8/10. No two slabs of quartzite are exactly alike but the color tones and wavy patterns look similar to marble. 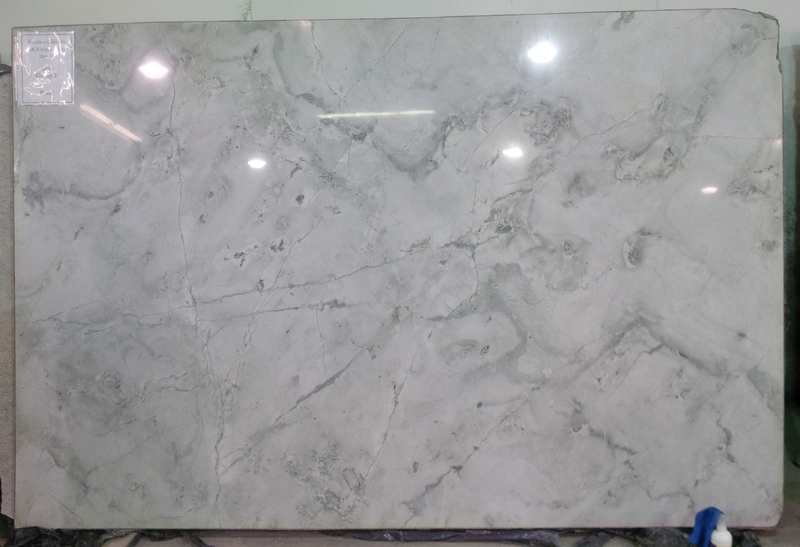 The slab I chose is called Brazilian Calcutta and it looks like this. Last but not least we have the appliances, sink, and faucet. We are keeping our existing white GE counter-depth french door refrigerator and white LG dishwasher because they are both fairly new, work relatively well, and fit the space. What we will be saying goodbye to is our almost 20-year old range/oven and the essentially non-functioning range hood that are pictured here. We will be replacing these with new GE appliances. We chose this microwave and this range. I am very excited about having double ovens again. 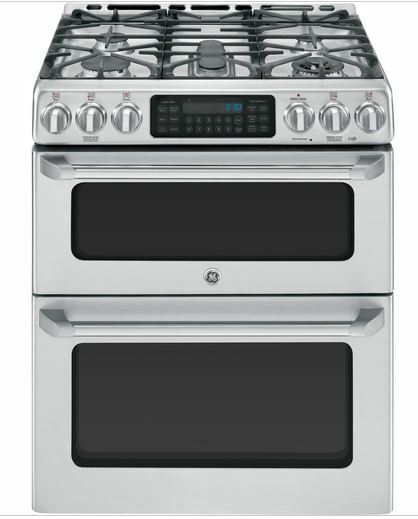 I had a range with double ovens when we lived in Hawaii and I used the smaller one all the time. However, as I mentioned before, what I am most excited about is that the range will vent outside and not just circulate the air back into the room. My current recirculating hood does a terrible job and it makes both Mark and I crazy. Although combination microwave/vent hoods aren’t as powerful as other free-standing vent hoods, this one has 300 cfm, which should be enough for my small kitchen and gets good reviews for venting on Consumer Reports. Anything will be better than our current situation, that’s for sure! As is somewhat typical, we were able to get a “free” sink with our countertops. The sink they offered us is a stainless steel, undermount variety and seemed to suit our needs just fine, so we went with that. I actually like a stainless steel sink and my only other requirement, other than it being wide enough on the diagonal to fit my largest pan, was that it be an undermount, so it seemed like a no brainer. The last thing that was left to decide at this point was the sink faucet. I decided that I wanted a design that only had one hole, and I wanted the faucet itself to pull down, rather than having a separate sprayer. It terms of looks, I didn’t want it to look too modern since the rest of the finishes were more traditional, but I also wanted something clean and sleek. 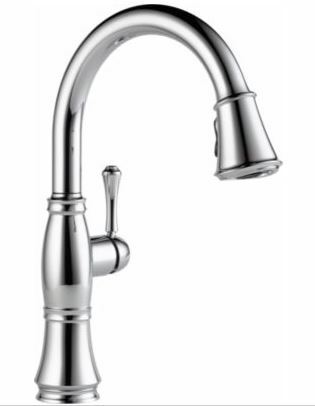 Enter the Cassidy Single Handle Pull Down Faucet from Delta. Isnt’ she pretty? So those are the choices we have made at this point. We are going to paint and install a backsplash ourselves so we haven’t finalized those details yet, but we are thinking a dark, navy/sea blue on the small part of the walls that won’t be covered with cabinets or backsplash and likely a simple, white subway tile with a medium toned grey grout for said backsplash. But those choices are still some time away, so maybe we’ll change our mind once the rest of the pieces are in place! 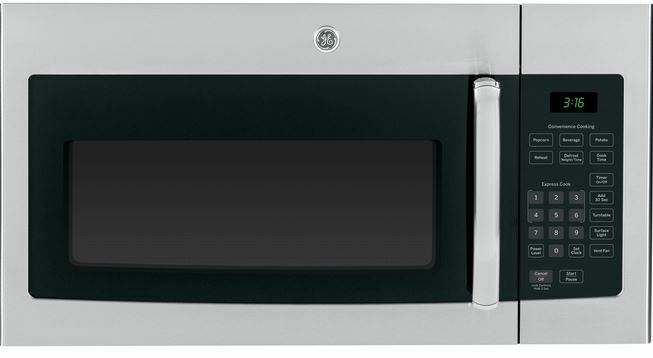 Our cabinets will be arriving Friday, May 1 and we are set to have them installed the following Monday. The week before that we will have folks here doing the necessary electrical and HVAC work which means that we’ll need to demo the current kitchen the weekend of April 25-26. I will be back then to share the details of that process.